Need a few quiet hours to work or write or think or walk or nap or do the dishes? Have you considered the potential miracle of a mother’s helper? That ten- or eleven-year-old homeschooled child from someone else’s family might be the key to helping your family blossom. When I had a houseful of littles, using a “tween-age” mother’s helper was a lifesaver. We called it “pay for play,” and I paid about half the going rate for babysitters, kicking in a tip. Because of the age of the mother’s helper, I was always home, checked in (sometimes spying on happy kids from around the corner so as not to distract contented play), and was careful not to give my young assistants inappropriate responsibility. I took care of the harder things, like meals and bathroom help, but I still got some uninterrupted time. Imagine this: while I had a mother’s helper entertaining the children, I could use my quiet time to be productive in my home-based communication business, I could take time to plan our homeschooling and family life, or I could take time for myself — to read or write or exercise or contemplate. Both boys and girls served as mother’s helpers for our three-boy family. During the summer and after school hours, neighbor kids would help for several hours once or twice a week, and during the school year, I sometimes had homeschooled kids who could give me several hours once a week during the day. Parents of my mother’s helpers were pleased with our arrangement. They liked that their son or daughter was being given a little responsibility and a taste of earning money, and they got positive reports from their tweens that I was not expecting too much or leaving them to cope with difficult situations. I did my best to model the nurturing skills I wanted them to learn and use. Sometimes coming to our house and being the “big kid” was just the ticket for a homeschooled child who didn’t have the same role in his or her own family–or one who wanted more of it because of the expertise gained with their own younger siblings. Parents liked that we had similar values, and we were cross-pollinating the homeschooling culture a bit. 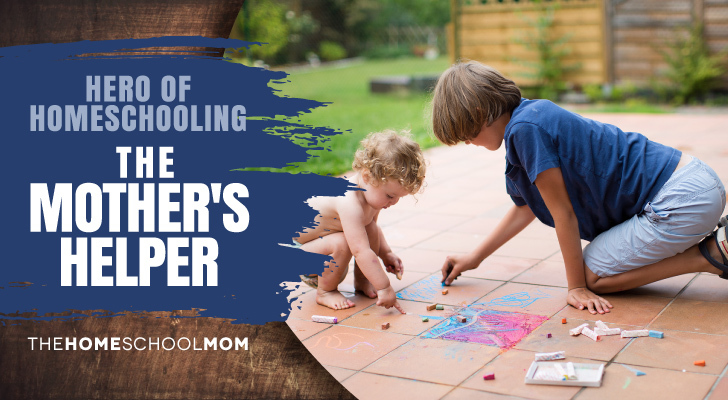 The mother’s helpers I had would read to my kids, draw with sidewalk chalk with them, ride bikes and scooters, play in the sprinkler, create in the sandbox, build with construction toys, dress-up and pretend, and more. We also invited some of them to participate in traditions like making Christmas cookies or dyeing Easter eggs, where I was fully involved, but we just wanted to share our fun. No pay for those occasions (and I was clear about that up front), but a chance to give our kids some slightly older homeschooled kids to look up to, and a chance for the tweens to get to know me and enjoy the warmth of our family. We were rarely turned down for these relationship-building good times. One of the upsides I did not anticipate was that my mother’s helpers grew into great full fledged babysitters who were worth the full babysitting rate within a couple of years, and my children loved them. They were used to our family routines and values, and they knew our kiddos’ quirks. As my mother’s helpers aged into babysitters, this meant I could sometimes take our older sons to an activity while the youngest was perfectly content with a babysitter he had grown up with. I was also able to provide great recommendations for our babysitters as they expanded their businesses. We had several kids who did not work out well as mother’s helpers, so I recommend you try them on a one-time basis rather than making a big deal out of your search for frequent flyers. The kids who did not work out were not quite mature enough and tended to create situations where the whole gang, including the mother’s helper, needed more of my attention instead of less. You know what I mean! I happily paid them for their time, but did not count on them for the future. I tried out new mother’s helpers when I was free of deadline pressure and knew I might need to be attentive. Mother’s helpers are still kids, and I kept my expectations realistic. The solid handful of amazing tweens who worked out as mother’s helpers were an integral part of my sons’ childhoods. Sometimes I come across the folder of poems I wrote during those years, and in my mind’s eye, I am looking out the window to see my (now grown) little boys happily careening around on scooters on the sidewalk, following roads chalked in place by one of our beloved young friends. Sometimes they got me through the day or through the week; they were some of the true heroes of our early homeschooling.